Hello avid fans, I know many of you are losing sleep from my lack of blog posts. I haven’t even gotten through all the fan mail you’ve sent, haha. In all seriousness, I’ve decided to take some time off temporarily to work on future plans. Many of you know that I’m in the middle of applying to grad school, trying to start my own wine vineyard (amazing things like this). But in the mean time, I’ve also signed myself up to take the MCATs in September. What this means is that my books and I are going on a honeymoon. I shall be back soon, my faithful friends. Until then, I’ll leave you with my last post until September. It’s chock full of three of my favorite easy summer recipes and I hope you find some inspiration to try something new! 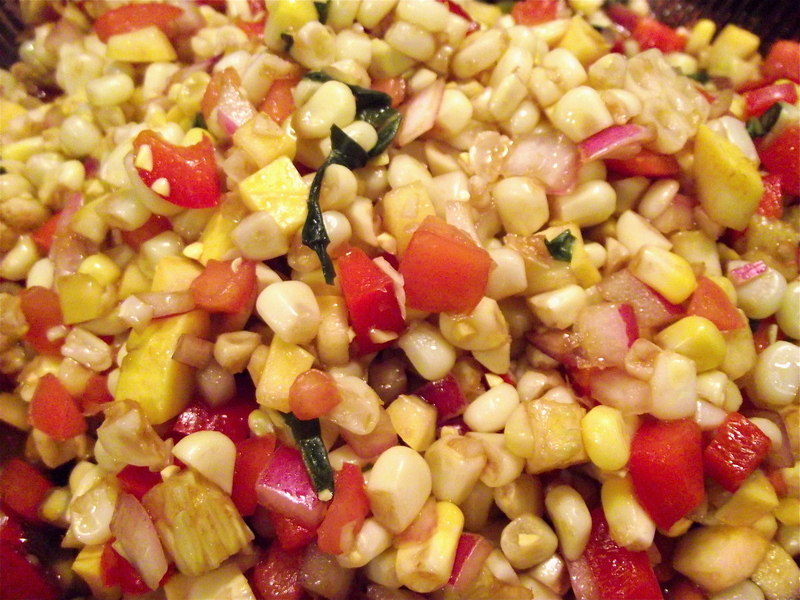 It’s almost the end of summer *cry* but it’s not too late to make this sweet summer corn salad. I think fresh corn on the cobs are still hangin’ around the grocery stores and I’d run..don’t walk to get your chops on this one. The following recipes are adapted from one of my favorite cooks ever, Ree Drummond, also known as the Pioneer Woman. Google her and you’ll never look back. Step 1: Fill a deep pot with water and heat to boiling. In the meantime, strip the husks off the corn and give them a good rinse under water. When the water is boiling, add the corn and let them cook for 15 minutes. We’re cooking them for a short time because we want the corn kernels to stay crisp! Step 3: When the corn is done cooking, run them under cold water to cool quickly then put them aside. Step 4: In the meantime, prepare the dressing: In a bowl, add the olive oil and balsamic vinegar. Whisk, whisk, whisk, until combined. Add the basil leaves and salt then whisk again. Set aside. Step 5: When the corn has cooled, scrape the corn kernels off the cob with a sharp knife and place into a huge mixing bowl. Add the rest of the chopped ingredients and pour the dressing on top. Stir until evenly combined. Done! Refrigerate at least 2 hours before serving. You can definitely make this recipe ahead of time; I’d recommend a few hours before the party, not the night before. If this doesn’t bring the taste of summer to your taste buds, I don’t know what will. Sooo good and fresh! The crunch of the corn, the snap of balsamic, and fresh basil just ties this salad up into a cute little bow. Step 1: Dice the tomatoes, onions, and jalapenos. You can opt to leave out the peppers if you’d like. If you include them, slice them down the middle and cut out the seeds along with the membrane (white stuff). I also recommend wearing gloves while cutting jalapenos. Trust me, you’ll thank me later. They burn!! Step 2: Rough chop a hearty amount of cilantro. You could go easy if you’re not a big fan. I happen to love cilantro so I go a wee bit crazy when I make it for me-self. When chopping, you can include the stems, but just make sure you chop them small enough. Step 3: Mix everything in a bowl and squeeze the juice of 1/2 lime plus salt to taste. Step 1: Split the avocados in half. Take out the seed and discard. Carefully, score the avocado into squares. Doing this eases the scraping and mashing process. 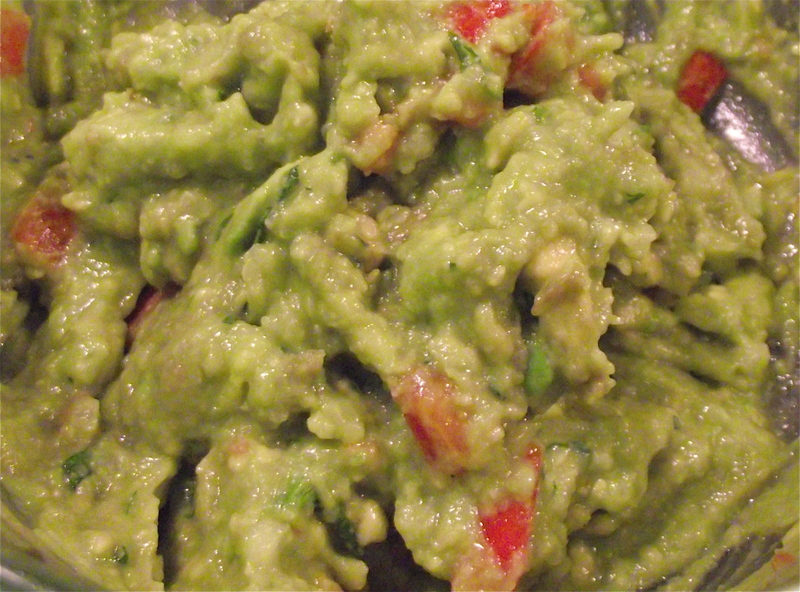 Step 2: Scrape the avocado into a separate bowl. Mash with a fork but leave a few small chunks. Add a bit of salt. Add a generous helping of Pico de Gallo. Mix gently. Step 3: Squeeze the juice of half a lime. 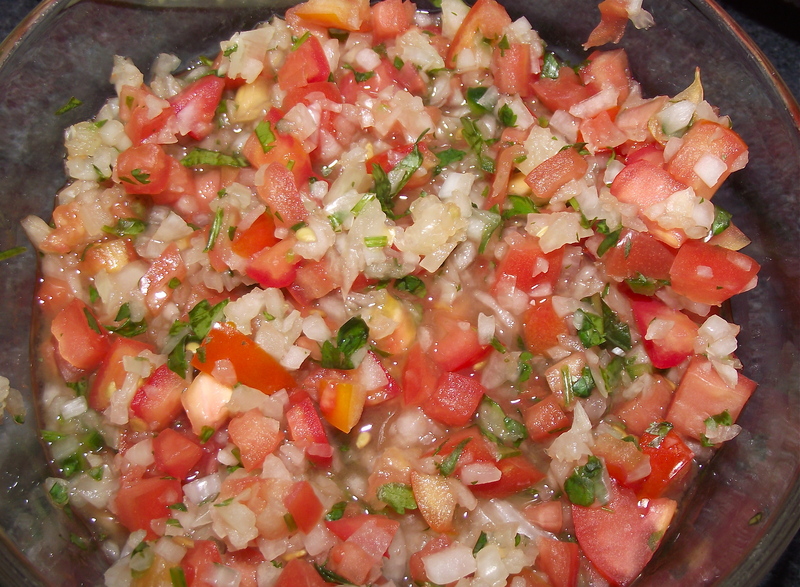 Stir, add salt and more pico de gallo to your liking. What?! That’s it?! Yes, so simple isn’t it?! It all boils down to one simple thing: use only the freshest, and I mean freshest ingredients. On tortilla chips, toasted pita bread, or even melba toast, this one’s a crowd pleaser for sure. So before I take off for a bit, I’d like to say thanks for the support and love from everyone, especially those who are also figuring things out for the big picture. There are few and far things in life worth sacrificing for but I think if you really feel you were meant to do something, mountains should be crossed, oceans sailed, pico de gallo eaten. Au revoir for now, don’t miss me too much. I’ll be blogging soon enough.